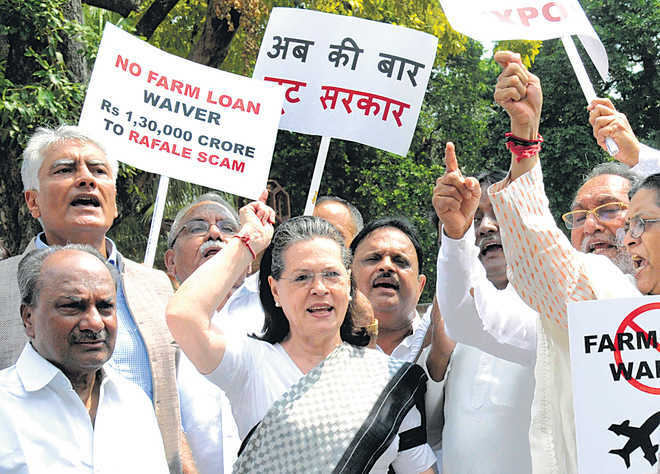 Congress leader Sonia Gandhi on Friday led the protests in Parliament over the alleged corruption in the Rafale deal and said her party’s stand on the triple talaq bill was absolutely clear. Congress MPs held protests outside Parliament demanding a joint parliamentary committee on the issue. Gandhi joined the protests while Congress chief Rahul Gandhi was away to Chhattisgarh. On Friday, Congress MPs disrupted the Lok Sabha forcing two adjournments demanding a JPC on the Rafale deal. Rahul Gandhi has been targeting the government for alleged corruption in the Rafale fighter jet purchase from France. Gandhi has been asking the government to come clean on the Rafale pricing and has recently accused the PM and Defence Minister of misleading the country on the same. Four BJP members, including Hamirpur MP Anurag Thakur, had then given notices of privilege against Gandhi for “peddling lies”. Congress MPs had subsequently given privilege notices against the PM and Defence Minister alleging that they were misleading every one on the deal by hiding behind the so-called secrecy clause in the deal which didn’t quite prevent the government from disclosing the price of the jets.